most people would intuitively recognize something “good”. In any case, my little bubble was burst today. Here are two form designs. Which one do you consider to be more usable and more aesthetically pleasing? Next postWhat separates bad design from good? I agree with the 2 gentlemen; although I am not a UX specialist. The only extra comment I have and probably this is because of my background as software developer, is that I will probably use dropdown controls instead of textboxes for Subject and Courses to avoid misspelling. 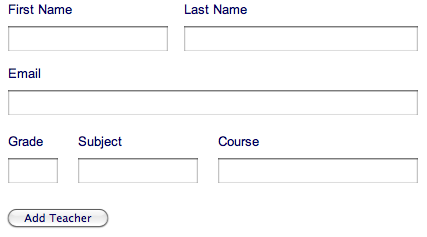 There’s definitely a case to be made for using dropdown controls instead of free-form text boxes. I do think it depends on the user group, the type of information that’s requested, and the sheer volume of the data that’s being asked for. In this particular case, the snap shot I provided is only a partial set of the data that’s being asked for. Speed and convenience for the user who has to fill out a long form are also important considerations for the overall user experience. Imagine having to use dropdowns to complete 10 sets of data. That could slow someone down considerably. I was also faced with an odd constraint: I was not allowed to re-design the flow of the data collection screens to help users complete their task accurately and efficiently. All in all, I agree with you that it’s not optimal. I, too, worry about making sure the UI helps users avoid errors and to keep the dataset clean. I fear the balance between usability and data cleanliness could not be achieved due to the imposition of the constraint I mentioned. First. need sppaaaaaacceee. tho i would incorporate the bg color on the first to make the fields pop. First one. More spaced out and cleaner. Less information is easier to focus on. Thanks for the feedback, Mig. Would you still recommend bg colour in the fields if the form is a screen and a half long? The snippet I provided is only an excerpt from the full form.